This challenge is actually quite common to labs who have big mice colonies and have to perform a lot of genotyping by PCR each week. This very well known researcher’s lab is located at the Institut de Recherche en Immunologie et Cancérologie (IRIC) attached to the Université de Montréal. The lab performs ”quick & dirty” gDNA extraction from mouse ear punches and the best DNA polymerase they could find to resist to PCR inhibitors present in their samples was ThermoFisher Scientific’s Phusion® HotStart II, a high-fidelity DNA polymerase… It worked well in their hands for MC4R Mouse Genotyping… but much less for their wallets! We took the opportunity and challenge to outperform Phusion® HotStart II using a simple Taq + Pfu hotstart blend. Please find bellow what we have accomplished using Transgen Biotech’s TransTaq HiFi DNA polymerase. 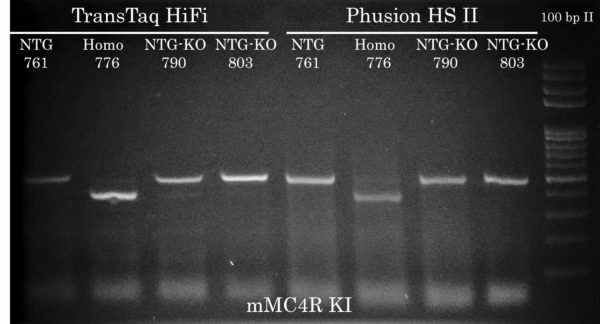 The MC4R KI mice also possess a Venus reporter cassette and a mutation in the human MC4R knock-in to distinguish it from the endogenous mouse MC4R by restriction digest and PCR. Four primers were used for KI mice genotyping. Both TransTaq HiFi and Phusion HS II were able to amplify the correct sized bands to bout the same intensity (PCR yield) but Phusion caused some more smearing than TransTaq HiFi. The mice from which DNA extractions were performed are covered by a patent, WO 2013185239 A1. Because Transgen Biotech’s DNA polymerases offer a wide window of annealing temperature for PCR amplification, we took the opportunity to compose a general PCR cycling protocol enabling the researcher to perform mouse genotyping for both KI and KO at the same time using TransTaq HiFi DNA Polymerase. This would make things much more simple for the researcher (and much cheaper compared to Phusion!). Did you know that this PCR optimization service is FREE ?! Not much to say except that it could be better. It works yeah, at 1$ per reaction or more… not worth it. Note that the constant smearing in the 776 sample (KO primer set) is more intense with Phusion than with TransTaq HiFi (upper gel; both were actually ran on the exact same gel). There should be NO BAND at all in this sample. We think that this may be due to DNA sample degradation. Continue reading below for gDNA extraction comparison. To Purify or not to purify your gDNA extractions? A common problem faced with quick ‘n dirty DNA extractions is sample degradation. Sometimes it causes little to no problem depending on the extent of DNA degradation. Non-specific bands and smearing. Using purified mouse gDNA, PCR amplicons are much more intense even if only 2 ul of the PCR reactions are run on the gel. Plus, NO non-specific bands were detected in the purified sample susing the KO primer set. Also in contrast to 761 and 776 samples, the ‘dirty’ McGill sample is not degraded and a clean absence of band is detected. Absence of high-molecular weight bands (not shown). Degraded gDNA will prevent you from amplifying DNA fragments greater than 500 bp.